Since this blog was begun more than three years ago, we have lost many of the great talents who helped to make The Julie Andrews Hour what it was. Meanwhile, some of our blogs have been taken down in part, due to the fact that a book on this great television variety show is in the works. Any and all contributions on the subject are most welcome. It has been a great pleasure and honor to live this experience and to write about it. During the 1960s, Julie Andrews won the heart of America and the world. Critics and fans alike agreed that she was one of Hollywood's greatest new stars. Her portrayal of Maria von Trapp in "The Sound of Music" and "Mary Poppins" certainly had facilitated this. Along with her films, Miss Andrews had created unforgettable roles on Broadway. In the early 1960s, she played Queen Guenevere in the legendary production of "Camelot," which also starred Richard Burton and Robert Goulet. Prior to that role, she starred on Broadway in "My Fair Lady" as the first musical Eliza Doolittle. Julie Andrews not only touched people through her film and theater performances, her numerous musical recordings and television appearances were dazzling works of beauty, earning her many accolades and fans. Julie's uniquely brilliant voice and lovely demeanor brought joy and inspriation to millions around the world. If you would like to see The Julie Andrews Hour released on DVD, along with possible music CDs, including a duets CD with Julie Andrews and her guests, please send a respectful e-mail to: Dan Gopal, Global Products of ITV, which owns The Julie Andrews Hour. Request ITV release The Julie Andrews Hour! CLICK HERE for PAGE TWO "Closed Set Blogs"
CLICK HERE for Page THREE "1973 Show Blogs"
See below for the next section of links. Author Michelle Russell is working on a book about Julie's wonderful television show, "The Julie Andrews Hour," which ran from 1972 - 1973. As of 2012, The Julie Andrews Hour has yet to be officially released on DVD. The series won 7 Emmy Awards. Recently, author Russell has conducted interviews with some of the persons who worked on the show. This information will be included in a much larger book about the show. Meanwhile, the immediate goal is to report these stories on the exact dates (or as near as possible) on which they occurred forty years ago. We hope you enjoy! 20. In-Between continued... A Reply! Julie's co-stars on the show were the brilliant impressionist Rich Little and actress-comedienne, Alice Ghostly. This great variety show also would include some of the top entertainers at that time, including: Carl Reiner, Steve Lawrence and Eydie Gorme and Sammy Davis, Jr, among others. 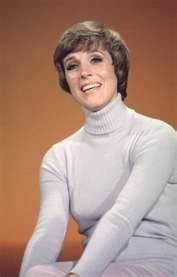 The creators' of The Julie Andrews Hour set about to produce the finest of musical variety show; a show that would be nothing less than this great star deserved. Executive Producer Sir Lew Grade had first seen Julie onstage as a young girl, and in for years had desired to produce a television show staring this great talent. He gave the show an unlimited budget, and as a result, producer Nicky Vanoff and director Bill Davis spared no expense. If something could make the show better, they did it. Cast and crew worked long hours to make sure that every detail was as near to perfect as possible. 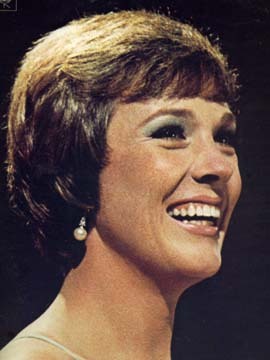 THIS SITE IS DEDICATED TO the history of The Julie Andrews Hour and the people who created it. In the following weeks, I will be creating a blog detailing that history and, in time, I telling my own story about the show. If you attended the show and would like to contribute a memory, please contact me. We are still under construction! Thanks for visiting.